One shouldn't miss this UNESCO World Heritage Site when visiting Yogyakarta, Indonesia. Candi Borobudur (pronounced as 'Chandee', which literally means temple), is the world's largest Buddhist temple, and as well as one of the greatest Buddhist monuments built in the whole world. I have been dying to visit this temple since high school, blame it to my obsession in Asian history and culture. Since the day I've first read about this place, I knew right from the start that I have to see this place before I die. Nothing's really unusual with this candi except that it was decorated with 2,672 relief panels and 504 Buddha statues. The temple comprises of six square platforms, topped with three circular platforms. People all over the world travel to this renowned world heritage site simply because of its allegory to enlightenment. Built during the reign of Sailendra Dynasty in 9th Century AD, Borobudur Temple was designed in Javanese Buddhist architecture - a combination of Indonesian indigenous group, and the Buddhist concept of attaining Nirvana. For some reasons, this temple was abandoned centuries after it was built. It was unclear whether it was due to the eruption of Mount Merapi, or the transfer of Buddhist kingdom to the east. We drove at least an hour to the province of Magelan, where the giant temple resides. At around ten in the morning, we braved the heat of the sun and entered the complex. Entrance fee for locals is only Rp. 30,000 (Php 90) but international visitors need to pay Rp. 250,000 (Php 800). Since I look like someone coming from the middle east (I didn't shave my beard for some reasons), the ticketing office didn't ask me questions and without hesitation, they charged me the international rate. Oh well papel, even if I blend in, they'd still charge me the higher rate because I don't speak Bahasa Indonesia. Lol, di pa rin lusot. Too bad, you need to return this before leaving the place. Kidding aside, the path to enlightenment was not a joke. The first flight of stairs was very steep and the scorching heat of the sun had already drained half of my energy, despite having seven hours of sleep prior this trip. But first, let me take a selfie, for prosperity's sake. Welcome to Borobudur Temple! My legs are ready! As you climb its steep stairs, you will notice that intricate bas reliefs decorate all corners of the temple, starting from the first level (base encasement). The reliefs depict the life of early Javanese culture during the 8th century AD, and people from all walks of life are well represented in every corners of the temple. Each level has different bas reliefs, with different stories to tell, mostly about Buddhist teachings. When you figured out what the relief was all about, you need to proceed to the next reliefs at the higher level. The path to enlightenment... is so kapoy! How did they do this stuff? Eavesdropped to learn more about the temple, but didn't understand a thing because the guide spoke in Dutch. Edi wow mag Wikipedia nalang ko ani! As we went higher, we noticed some headless Buddhas. According to the locals, since its rediscovery in the 18th century by the Dutch, hundreds of Buddha statues were decapitated and the heads were sold in black market. Only a few were recovered and are currently housed in museums around the temple complex. Headless Buddha. Wawa naman you. Once you finally understand all teachings of the bas reliefs (or simply put, if you can't bear the scorching heat of the sun), you can now proceed to the highest level of the temple, the nirvana. The highest level has perforated stupas (or bells) with statues of Buddha housed inside. It could've been more picturesque if Mount Merapi was on the background, but due to the reckless man-made forest fires in Java, Kalimantang, and Sumatra, the visibility wasn't really that great despite the good weather. 225 selfies and group photos later, we went down and took more photos of the temple, this time from the other side. A half day tour in Borobudur was really worth it. I will be forever amazed by its stunning architecture, history, and its written culture on its four corners. You can wear shorts, slippers, or even tank tops. I've seen a lot of foreigners wearing beach attire. I guess this is the preferred attire as the weather gets very hot and humid on most days. After paying the day pass for international tourists, the lounge has free coffee, tea, and water. They'll also give you a navy blue sarong, but sadly you can't take it home as you'll give it back after touring the temple. Ganda pa naman sana pang souvenir. Lol. There are sunrise tours in Borobudur Temple. The last time I checked, it costs higher at Rp. 320,000 (that's almost one thousand pesos). Wake up call is at 4:30AM as the sunrise time in Borobudur is around 6AM. Sunrises add drama to every photos so make sure you don't miss it. It's worth it, if you ask me. I didn't try it due to our tight schedule in Jogja but, I have witnessed a very dramatic sunrise at Angkor Wat Temple in Siem Reap and it was really worth it (though, the day pass in Angkor Wat is fixed at $20, regardless the time). Wow! This is temple is beautiful. Oh no! what happen to headless Buddha? Thank you for sharing your trip. The pictures are all beautiful. I love visiting heritage attractions. I haven't been to Indonesia but this one is enticing to visit. my sister + I were just talking about UNESCO World Heritage Sites + how we love to visit a number of them in this lifetime. This is included in my list, I hope I can see this with my boys one day soon. 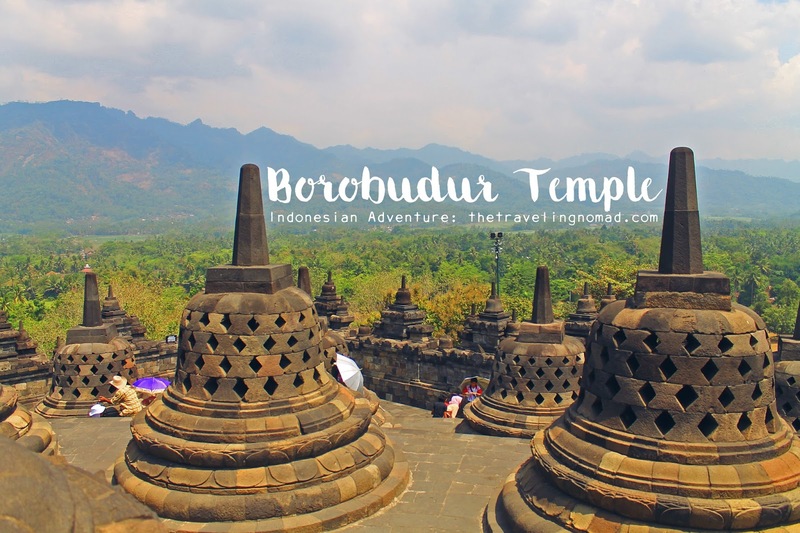 I was with my mom and it was a dream come true to visit Borobudur Temple. Like to explore this place and sometimes, I saw this in some films. Really, international tourists wants to visit this place. Yep! Some even flew all the way from the other side of the planet just to be here. The place is just surreal!